“They’re so fierce!” Wazi Maret, Development Director at the Transgender, Gender Variant, Intersex Justice Project (TGIJP) is talking about London and Nicki, two young trans women from New Orleans who are visiting TGIJP in San Francisco for two weeks, to build inter-generational connections. But he might as well be talking about himself, or TGIJP. All are pretty fierce. 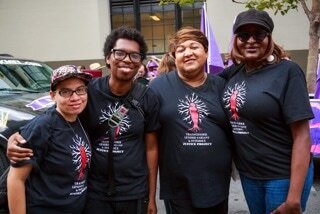 ​TGIJP got a $14,000 grant in 2016 from the Fund for A Just Society, to further its work on transgender justice in the San Francisco prison system, among other things. ​“We are working with the sheriff’s department on a housing policy that has the potential to be transformative. 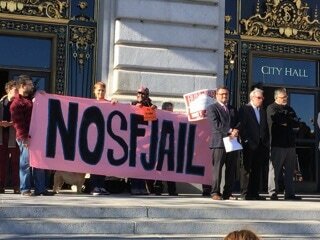 If it’s implemented in San Francisco jails, then people would self-determine where they go. This policy puts a little bit of power back to our people. It’s about gender self-determination,” Wazi explains. The policy is still in its nascent stages, and involves many challenges. “The Sheriff’s department is so bureaucratic and slow,” he says. And nobody really knows how the gender self-determination will work out. How many genders? Where will they go? It is an urgent question, and TGIJP is uniquely equipped to grapple with it. TGIJP was founded in 2004 through a Soros Fellowship, to challenge and end human rights abuses committed against TGI people in California jails and beyond. It provides peer support, leadership development, re-entry support, and connections among individuals and groups. Its newsletter, Stiletto, comes out biannually and is read by hundreds of people both in and out of prison. Everything, from monthly support groups to training sessions on security and safety to creating a coalition with Black Lives Matter, aims to foster solidarity and change basic conditions for TGI people. ​TGIJP is excited about collaborating with the Fund for a Just Society, and will measure its success in the prison program by the progress of the housing policy. It is noble and important work. Given that one in two African-American trans women is jailed in her lifetime, clearly our society needs to do more to support this very marginalized group. With TGIJP, trans women, especially trans women of color, are forging their own culture of resilience and resistance. Wazi, a trans man, volunteered with TGIJP for a year before moving to a full time paid position. He loves it. He loves being part of a group of TGI people “inside and outside of prisons, jails and detention centers – creating a united family in the struggle for survival and freedom.” Fierce indeed.